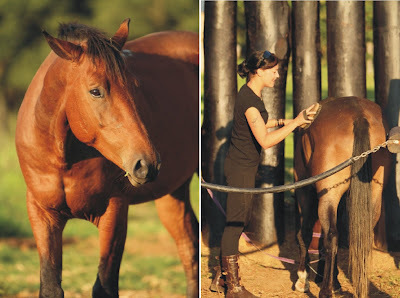 A glimpse of our four legged beauties at Rorke's Drift Lodge! We are thrilled to bring you up to speed on the developments of our stables, which are moving along smoothly and we are getting close to completion on the construction side of things. Werner and his crew have so far constructed the entire stable yard with a single chain saw, a decent supply of blue gum trees that have long waited to be put to good use along with 700 liters of creosote and their bare hands! It is amazing what the human body is capable of accomplishing when the motivation offers inspiration. Where most people are overwhelmed by uncertainty when faced with what seems to be the impossible, others get inspired! It seems that the African battlefields of late still have this effect on some! Not that we are conquering armies but rather the mind set of what we believe to be our limitations. We live an extraordinary life here on the battlefields surrounded by heroic tales that transport us into a historic dimension offering a exhilarating ride for those who are ready to be swept away by each day! We are nearly ready to take you on a ride like no other!